Today we’ll talk about what’s behind the trends in acidity for different molecules and discuss the most important factors that determine these values. I’ve written in schoolmarmish tones before about how pKa is one of the most important measures you can learn in organic chemistry, and not knowing some basic pKa values before an exam is a lot like walking up to a poker table without knowing the values of the hands: you’re going to lose your shirt. Bronsted acids are proton donors, Lewis acids are electron pair acceptors. Converse: Bronsted base = proton acceptor, Lewis base = electron pair donor. A conjugate base is what you obtain when you remove a proton (H+) from a compound. For instance, HO– is the conjugate base of water. O2- is the conjugate base of HO–. Conversely, conjugate acids are what you obtain when you add a proton to a compound. The conjugate acid of water is H3O+. According to this, anything which stabilizes the conjugate base will increase the acidity. Therefore pKa is also a measure of how stable the conjugate base is. Put another way, strong acids have weak conjugate bases, and vice versa. Note that once a conjugate base (B-) is negative, a second deprotonation will make the dianion (B 2-). While far from impossible, forming the dianion can be difficult due to the buildup of negative charge and the corresponding electronic repulsions that result. This point causes a lot of confusion due to the presence of two seemingly conflicting trends. Here’s the first point: acidity increases as we go across a row in the periodic table. This makes sense, right? It makes sense that HF is more electronegative than H2O, NH3, and CH4 due to the greater electronegativity of fluorine versus oxygen, nitrogen, and carbon. A fluorine bearing a negative charge is a happy fluorine. But here’s the seemingly strange thing. HF itself is not a “strong” acid, at least not in the sense that it ionizes completely in water. HF is a weaker acid than HCl, HBr, and HI. What’s going on here? You could make two arguments for why this is. The first reason has to do with the shorter (and stronger) H-F bond as compared to the larger hydrogen halides. The second has to do with the stability of the conjugate base. The fluoride anion, F(–) is a tiny and vicious little beast, with the smallest ionic radius of any other ion bearing a single negative charge. Its charge is therefore spread over a smaller volume than those of the larger halides, which is energetically unfavorable: for one thing, F(–) begs for solvation, which will lead to a lower entropy term in the ΔG. Note that this trend also holds for H2O and H2S, with H2S being about 10 million times more acidic. A huge stabilizing factor for a conjugate base is if the negative charge can be delocalized through resonance. The classic examples are with phenol (C6H5OH) which is about a million times more acidic than water, and with acetic acid (pKa of ~5). Predictably, this effect is going to be related to two major factors: 1) the electronegativity of the element (the more electronegative, the more acidic) and the distance between the electronegative element and the negative charge. Again, the acidity relates nicely to the stability of the conjugate base. And the stability of the conjugate base depends on how well it can accomodate its newfound pair of electrons. In an effect akin to electronegativity, the more s character in the orbital, the closer the electrons will be to the nucleus, and the lower in energy (= stable! ) they will be. Look at the difference between the pKa of acetylene and alkanes – 25! That’s 10 to the power of 25, as in, “100 times bigger than Avogadro’s number”. Just to give you an idea of scale. That’s the amazing thing about chemistry – the sheer range in the power of different phenomena is awe-inspiring. There’s actually a mnemonic I’ve found that can help you remember these effects. This is credited to Dr. Christine Pruis, Senior Lecturer at Arizona State University Tempe. Tread carefully with mnemonics, but there you go. I just wanted to say you are doing an absolutely fantastic job of teaching organic chemistry and making it comprehensible. I’ve been reading your posts for the last few days, and material which was alien to me before as finally started to make sense. That’s a thorny issue… it can be hard to separate the influence of inductive and resonance effects. Do you have a specific example that you’re thinking of? I have a related question. I’ve read that in most cases, resonance stabilization decreases basicity. But is it true that in the cases of guanidines and amidines, resonance increases the basicity? If you could explain how, that’d be great! I was the most confused person who could not understand the concept. I read your note. I received 100% on Acidity part on my Exam. Thank you! This is the kind of comment that makes my day. Thanks! I love this site… I hate reading organic chem txt books because most are boooooring but you make studying for O-chem the highlight of my friday evening… You are funny, and your delivery style is absolutely amazing!! I am in O-chem II, barely made it through the first but I am excelling in my second…. Thank you sir for doing this!! I appreciate it more than you know… Good day! Thank you so much for this summary sheet, I was having so much trouble trying to figure out what made a molecule more acidic – and here it all is! Fully explained and easily understandable. Fantastic stuff. I just wanted to thank you for all the work you put into this site. I’m an undergraduate at Yale and for the past semester, I’ve been afraid I’ll fail Orgo. Thanks to your site, I no longer feel as stressed because you’ve done such a good job of explaining things. So, yes, thank you!! Thanks Laina. Glad you find it useful. Let me know if theres anything I can do to make the site more helpful for your needs. I have a problem where I have to determine the most stable conjugate base, which indicates the strongest acid. I just want to know, is it possible to have a strong acid according to its pKa value, but according to atom, resonance, etc. another acid is stronger? pKa represents an experimental measurement. Experimental measurements are primary – the concepts we pull out of them, such as the factors mentioned, are secondary. So what you’re mentioning isn’t possible, assuming all other variables are the same. I just don’t seem to understand why does ionic radius increase acidity? I mean, Binding Energy decreases and it’s more easy to lose an electron, if acids are compounds that accept electrons how does acidity increase? All these stuff were very useful to me. Got to know more things that I didn’t know before. Thanks a lot..! Similar article on basicity will be appreciated a lot..! On the figure describing inductive effects on pKa of carboxylic acids you have bromoacetic acid with pKa of 2.86 on one line and 2.97 on the next. Why the difference? Fixed. Thanks for the spot – Evans’ pKa table says 2.86. Not sure where I pulled the 2.97 from. This site is so helpful. It makes organic chemistry way easier. Thank you! Glad you find it helpful Luis. Oh wow, this is amazing. I was starting to think there was no site/book that had exactly this information, this compactly (and brilliantly, might I add) presented. Thank you so much! You’ve got no idea how much this helped (and how much it reduced my study time, god knows we can all do with extra time on our hands :) ). Thanks again! Can you please make these notes available as PDF? it also has browser plugin..
Organic is my favourite part in chemistry. Your post and contents provided me a good quick revision before my exams and I did extremely well….. Thanks to you….you have a good way of teaching organic chemistry.. I would definitely recommend this site to my friends who think organic is boaring subject…. I am curious how you came up with this CARDIO acronym? And when? I have heard it from one other person a few years ago. I shamelessly stole it from a comment thread on SDN. Did you get the CARDIO acronym from a Dr. Christine Pruis or Chad’s Reviews from Arizona State University? Dr. Pruis is our Organic Chemistry professor and came up with this acronym 7-8 years ago, so perhaps that is the ‘credit’ you speak of? If so, that is awesome! This was really clear and helpful Thank you so much!! When trying to choose a compounds with the highest acidity, according to CARDIO, how do you determine which factor you should prioritize first? Suppose you’re trying to determine which compound is more acidic, CHCH or benzene ring? When you remove the proton the benzene ring is stabilized by resonance but the HCC- has a lot of s character in its orbital. How would you determine which compound is more acidic? Just wanted to sincerely thankyou for transforming an extremely difficult subject into something comprehensible and futhermore enjoyable. There’s something to be said for that specific talent and it is greatly appreciated. Your use of acronyms and descriptive context have improved both my labs and test marks. do lone pairs count when figuring out the hybridization of an orbital? 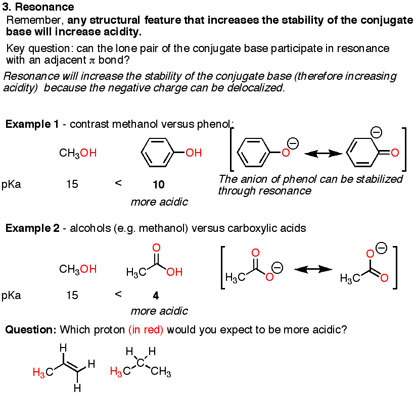 and for factor #5… do we look at the hybridization of the acid or the conjugate base? Fantastic! What an explanation…. Truely helpful and admirable…. Thank you so much! Love reading through everything! You make it so understandable and interesting! I really appreciate the links to more topics too! Why is it that HF is more acidic than HI (#2) , but when its connected to the carboxyl group it is I that is more acidic? Anyone? Hey! These pages have been great, where can we find the answers to the problems you usually give at the end? why staboilization of conjugate base enhance acidity ? Equilibrium tends to proceed toward the more stable product, yes? So what happens to the equilibrium HA –> H+ A- as you make A- more stable? 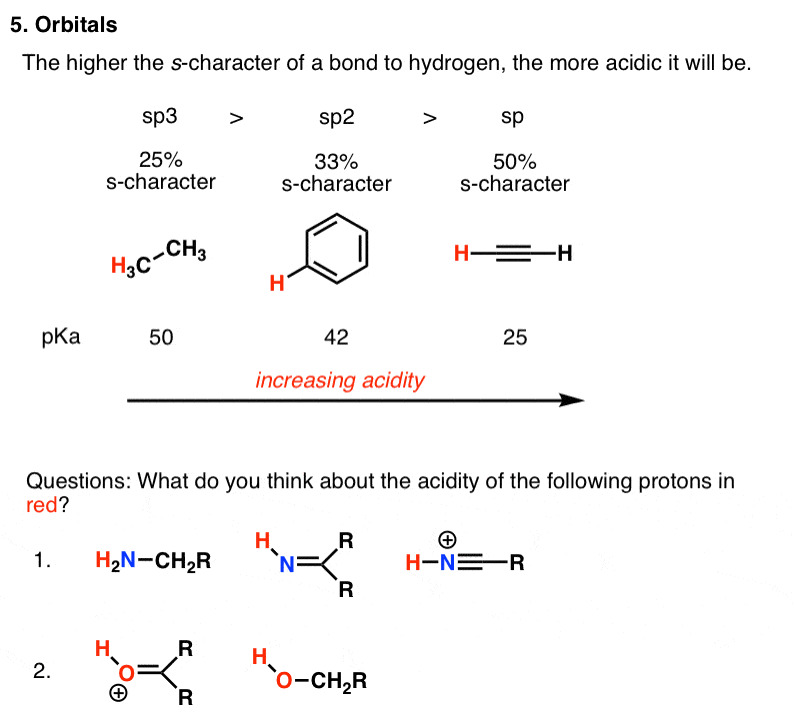 Hi, I’m confused as to how hydrogen bonding in specifically the Halides, affects the acidity. Hi James, firstly, a VERY big thank you to you for this amazing website. Its makes organic chemistry SO easy for me to understand! I think there might be a slight error in the ‘Orbitals’ section of this article. In the graphic, the acidity increases from sp3 to sp (rightward, ascending order) while the signs ( < ) show otherwise. I might be missing something, so please correct me if I am! Thank you so much for creating this easy to understand article. I was about to give up until I stumbled upon this today. This will be the FIRST place I check to help me through orgo! Cheers! Basically the same thing explained in a more elaborate ( slightly better ) way. Please know that I absolutely love what you’ve done. You’ve made organic chem a million times easier. This is just one of the VERY rare cases where I have found a better reference. Thank you – that is indeed a nice reference. I had a question if you have a moment! I understand the setup of the Ka formula, but for the life of me, I don’t understand what the numbers ARE. When you punch it into the formula, what numbers are you punching in for certain atoms and/or compounds in order to get the Ka, and then get the pKa. It’s not explained in my text, or any resources I may have. My professor is also not very great at translating our questions in class. It’s obtained from measurement – from experiment, in other words. It can’t be just “figured out”, we have to physically do experiments that measure the equilibrium constant. I have been looking for a thorough explanation like this for such a long time, being unable to find one. This is really helpful for a med student struggling with his Chem & Intro to Bio exam, thank you so much James. Hi I had a question. 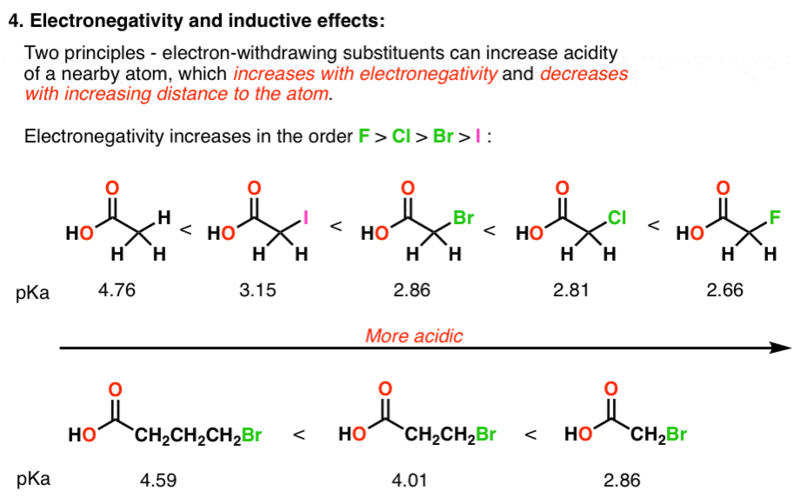 When taking inductive effects (electron withdrawin and electrons donating) into account are we looking at the conjugate base or the acid itself if we wanted to apply rules such as neutral N or O are considered electrons donors? You’re looking at how well the stabilize (or destabilize) the conjugate base. Anything which stabilizes the conjugate base will result in a stronger acid (and vice versa). For example HOCF3 is a stronger acid then HOCH3 because those three fluorine atoms help to stabilize the conjugate base, -OCF3 through the inductive effect. 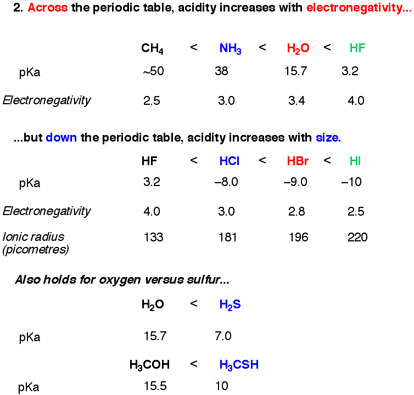 we know that NH3 is stronger but why doesn’t the electronegativity of the central atom come under consideration here? N has a high electronegativity so it’s tendency to donate lone pair of electrons should be low right? Please please please help. May God bless you sir . My sister had her exams and needed help. I, although being a student of commerce stream , decided that I had to help her in every way I could. But I knew I sucked at organic chemistry in school,and so did my little sister . I found your site , and the next day I am understanding things better than I ever did , .. …I would look up about anything I didn’t know on your website . getting to the main thing , my sister scored 97 in chemistry , full marks in the organic portion. First of all thanks and now the question- what is +R and -R and how to recognise them. Sir i am stucked please answer urgently. I found your posts extremely helpful ! In comparing the acidity/basicity of organic compounds, which of the following has the stronger effects? And how to determine the acidity of substituted aromatic compounds, such as benzoic acid? How does the difference in bonding between carbon and nitrogen effect the acidity? In this compounds, carbon atoms may exert two effects, related to the s character of nitrogen orbitals and the electron donating properties of alkyl groups. Your article has been very helpful and I now have actually a chance to pass my exams in general chemistry! I just want to ask, we have to apply these factors in sequence, as you have given them or not??? I mean first the charge, after the atom etc?? this is amazing. So much better than my textbook. Thank you so much! Sir you are a fantastic teacher and I am sure that you are also a gentleman. And of course your knowledge of organic chemistry is commendable Really out of the world. Your post are very good and really a big fan of your THANKU ? You have done a great job. I was so confused with this topic and after reading reading your explanation my concepts were very clear. Thanks a lot ! ? Thank you so much, this was so clear and concise and exactly what I needed to review for my exam! Excellent, glad it was useful Christine! Hi is this mnemonic in order of decreasing effect? Meaning if there were two molecules that I’m trying to decide which one is more acidic, can I say that since molecule A wins out on the dipole induction despite that molecule B wins out on having more “s” character, molecule A is more acidic? It’s difficult to estimate the magnitude of different effects directly. That’s why pKas are measured. What you should look for is to identify trends within one of these key factors. However if you want to share an example in the comments, that’s cool.